Belgium take on Group F winners Hungary in a round of 16 matchup on Saturday night, looking to record a third clean sheet victory in a row. This article contains our Hungary v Belgium betting preview with free predictions, betting tips, special odds, probable line-ups, streaming links, bookie offers and no deposit free bets on Euro 2016! Hungary started their Euro 2016 campaign with an impressive 2-0 victory against Austria. A 1-1 draw against Iceland in the second match, secured their place in the last 16 and they finished with a thrilling 3-3 draw against Portugal, to top Group F. Finding the net has not been a problem for Hungary, which tallied six total markers in three group-stage outings. Hungary are likely to recall Laszlo Kleinheisler, Krisztian Nemeth, Tamas Kadar and Adam Nagy. Each and every one of them was on a booking and rested for the final group game. Zoltan Gera was brought off at the break against Portugal but he should be fit in time to start here. Belgium got their tournament off to a worrisome start with an uninspired 2-0 loss to Italy, a result that costed them the first position in Group E. Then they defeated Republic of Ireland 3-0 in their second game and recorded a 1-0 win over Sweden in their final group stage round. Despite those successive wins question marks still remain about the talented individuals coming together as a team. Mark Wilmots is unlikely to make any drastic changes to the his starting XI. Anyway, Mousa Dembele and Radja Nainggolan are in contention to partner Alex Witsel in front of the midfield. Ferreira-Carrasco, De Bruyne and Hazard will be the three offensive midfielders behind the lone striker Romelu Lukaku. 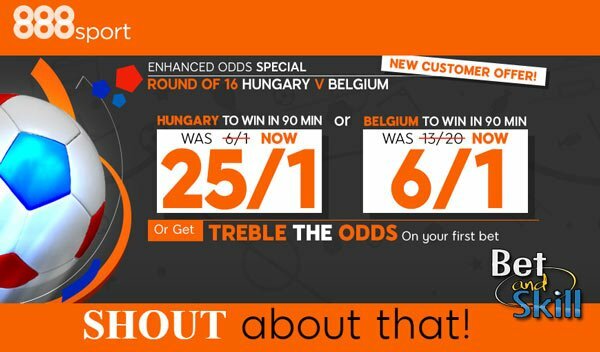 "Hungary v Belgium predictions, betting tips, lineups and odds (Euro 2016 - round of 16 - 26.6.2016)"